Being a Philadelphia native, my favorite thing about November is the Wawa Gobbler hot turkey sandwich. I re-created these cranberry and turkey sandwiches — a regional staple — at home for #SundaySupper’s Thanksgiving leftovers theme! In the days after Halloween, usually after bingeing on leftover candy, I need something savory to balance all that sweet. If you’re on the mid- to northern-East Coast, you’ve likely heard of the popular local convenience store called Wawa. I head there for a hot Gobbler sandwich. 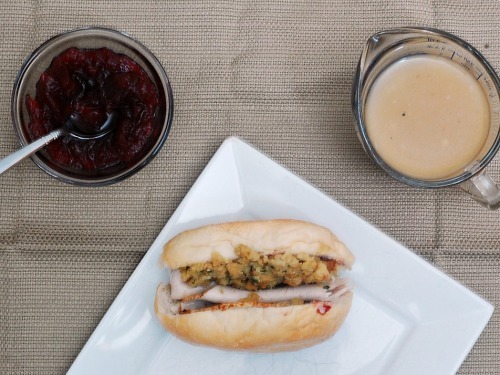 The Gobbler is a hoagie sandwich (also known as a sub sandwich or a hero), with cranberry sauce as the condiment, and stuffed with hot turkey meat dripping with gravy, and stuffing. It’s like having Thanksgiving leftovers before Thanksgiving even gets here. 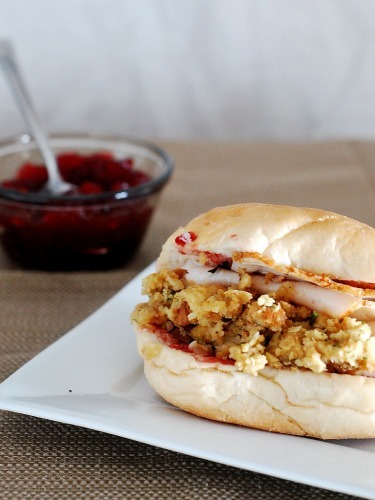 You can make cranberry and turkey sandwiches at home with your Thanksgiving leftovers. You’ll need club sandwich rolls (I used 4-inch long rolls, also called “catering” rolls, but you can use any size you want, though for longer rolls, you’ll need extra filling ingredients); turkey meat (light or dark), sliced about 1/4 of an inch, or thinner. You’ll need gravy, and stuffing (the moister, the better), and jellied cranberry sauce. You could also serve these on leftover buttermilk biscuits. Want to make these at home, but you’re not hosting Thanksgiving (or otherwise somehow used up all of your leftovers)? Grab some roasted turkey deli meat, and ask them to slice it thick. Then either make some stuffing, or get the stuff in the box at the grocery store. Voila! Warm the gravy in a medium saucepan over medium heat. When just starting to simmer, add the turkey meat, and heat just until the turkey meat is warmed through. Split the club sandwich rolls, and spread 1 tbsp of cranberry sauce on both sides of each roll. Arrange 4 ounces of turkey meat and 1/4 cup of the stuffing on each sandwich roll. Spoon more gravy over top, if desired. Don’t forget to check out the other #SundaySupper Thanksgiving leftovers recipes! Previous Post: « Three years old! I’ve just become a fan of the Gobbler! What a terrific post Thanksgiving sandwich! That I just want to grab and take a huge bite. 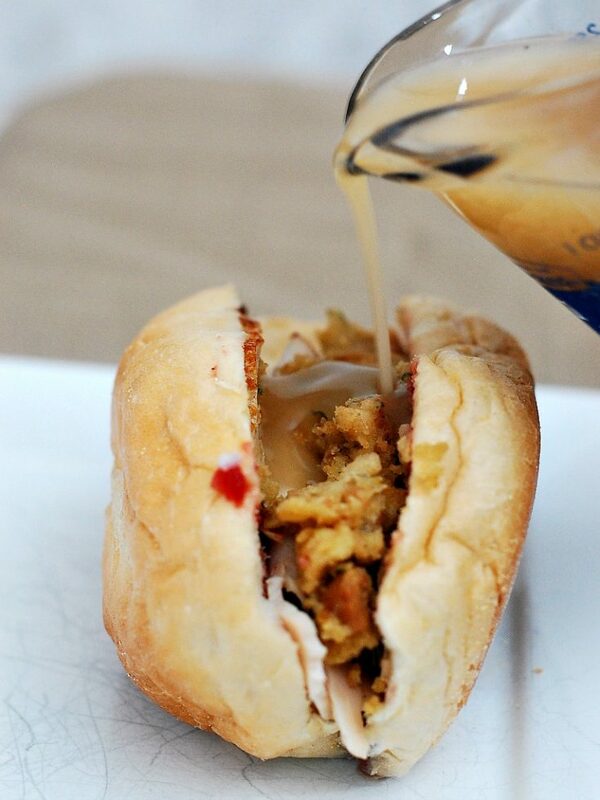 Love the shot with the gravy being poured on, YUM!! Omg. The Gobbler!!! You know, I never actually had one of these growing up but I do remember how crazy everyone would get around this time of year when they were available. You are totally making me miss Wawa! The Gobbler needs to make it’s way to Florida and into our family table! This sandwich looks amazing!! 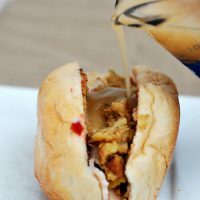 I love combining everything on my plate on Thanksgiving day, so this is sandwich is right up my alley. Love it! This is how I love my Thanksgiving sandwiches! Gotta love the carb-on-carb love with the addition of stuffing which is an important component in my opinion! I’ve been living in NJ for over 4 years now and have heard about all the great things about Wawa, but have not seen a single one! Maybe I need to check out central or south Jersey! I’ve lived in NJ and PA my whole life and have never eaten at a WaWa. But I keep seeing people talk about the Gobbler and now I want one! I’m definitely going to make this with our leftovers. HOW have you never eaten at Wawa?? Everytime I see these photos my stomach starts growling!! I can’t wait for leftovers!! Any sandwich with a pourable sauce is a winner in my book. Happy holidays! A great sandwich idea. I do love WaWa coffee though! Without the stuffing, this was MY after holiday lunch for sure! Okay, how crazy is this – my husband and I went to the Philly area for Thanksgiving with his family and stopped in a Wawa for a bathroom break on the way home and I think I saw one of these! !